I looked on Yelp for a burger restaurant near my place. Usually, I look into reviews, ratings and photos to evaluate a restaurant. Most of people would talk about the how good the food is and post pictures of their food! This particular burger restaurant caught my attention by its reviews and photos not of the burger but the customer experience imagine photos of the experience not the burger! So I decided to give it a try. I went there, it’s a small restaurant, very old style, closes at 7PM and only cash, I left the place and was going to another restaurant. However, I’m very interested in analyzing customer experiences and value propositions that businesses provide. So I got cash from the ATM 2 blocks away and went back to the restaurant. I stood at the cashier for like 3 minutes until an old woman came and the phone was ringing, she said, give me a sec to get this. She picked up the phone, answered, Oh hi Tony, so you want this and that, she wrote it down and so so no hotdogs today? I thought that must be a very frequent customer. She finished the phone order and asked what can I get for you? I said a double cheeseburger, no onion, no tomato, no pickles and a cup of water. She said have a seat and will bring it to you. I start eating and my mind was blowing from the delicious and juicy burger I’ve ever had. So I left the place, with an outstanding experience, great quality food, very delicious food and amazing experience. I tweeted about it and got 2500 people who saw the tweet even though I only had 30 followers. I told everyone about it which is unusual from me to do that, but that was amazing. A few days later, I went there with my cousin. The old woman said hi welcome back. And she said so, a double cheeseburger, no onion, no tomato, no pickles and a water for you? I was speechless, how on Earth she remembered my exact picky order from my second visit! She’s been in this restaurant for years taking millions of burger orders and she remembered exactly my order! My cousin and I had our burgers with a personalized message and drawing. Of course, I enjoyed every bite and did not want that burger to finish because of its amazing deliciousness. My cousin said it was his best burger ever. Not only we had an amazing experience and a delicious burger, but also we became regular customers and we told our friends and shared it with everyone on Social Media, and this post! It was an outstanding customer experience that exceeds the expectation! A life example that businesses need to learn from! 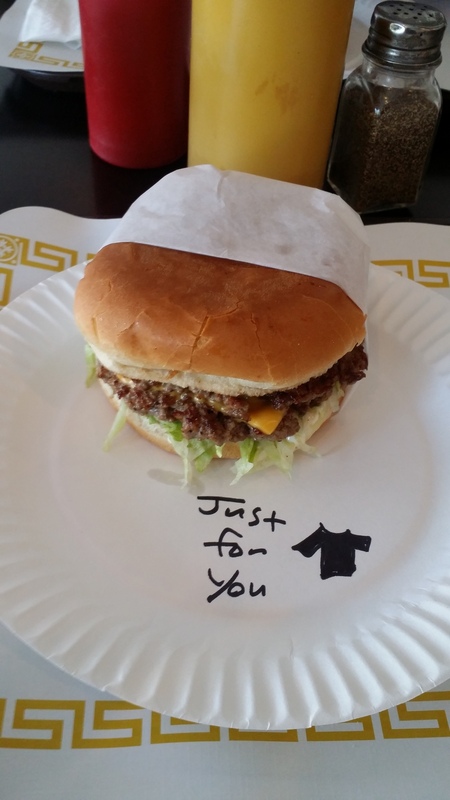 The burger restaurant called Irv’s Burgers, Yelp page. The old woman’s name (the amazing servant) is Sonia (picture below)!